Brand extension is the single most attractive option for mature brands that have to some extent saturated the target demographic with existing offers. Often, the need to extend a brand is felt when the competition is doing so, but creating attractive, competitive offers can cannibalize much of a brand’s less-loyal followers. Thus, choosing to NOT extend a brand is often a serious risk in and of itself. Among the primary methods companies use to extend their brands are (listed in order of dramatically increasing strategic risk): extended or new offers, extended or new targets, and extended or new positions (sometimes required to reach new targets). Creating an extended or new offer while maintaining existing targets and existing positions is considered relatively low risk. Introducing an extended or new offer is fairly easy to research in advance, and even if the research is flawed and the product is not widely accepted (unless the product introduces other negative factors such as poor quality), it is unlikely to do much long term harm other than the loss of the initial investment to create and launch the new offer. 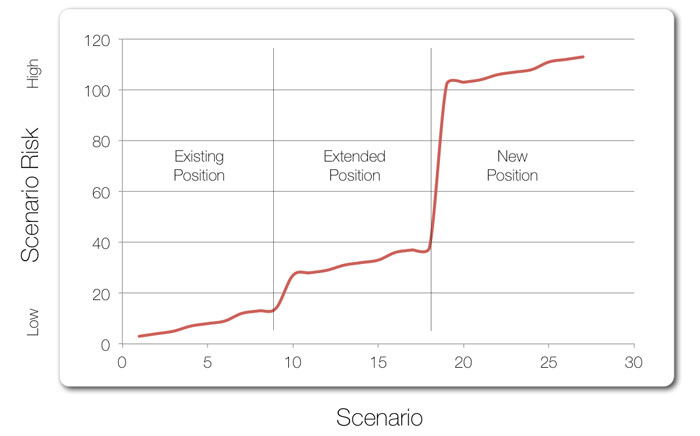 Extending or approaching new targets has higher risk. This higher risk arises from the fact that a company often does not understand the extended or new target very well and the company’s focus on a new target may in some cases alienate the current and historical target leading to erosion of the base business. Lastly, extending or creating an entirely new position entails the highest risk because it entails modifying or even abandoning the very reason that current customers are buying from the brand. These numbers are somewhat arbitrary but reflect common strategist opinions about the relative risk of different approaches. The three noticeable plateaus on the chart above are of course driven by our assignment of risk associated with existing, extended or new position. Clearly, to deviate from existing successful positions begins to dramatically increase risk compared to other methods of brand extension. Do extend, but extend wisely!